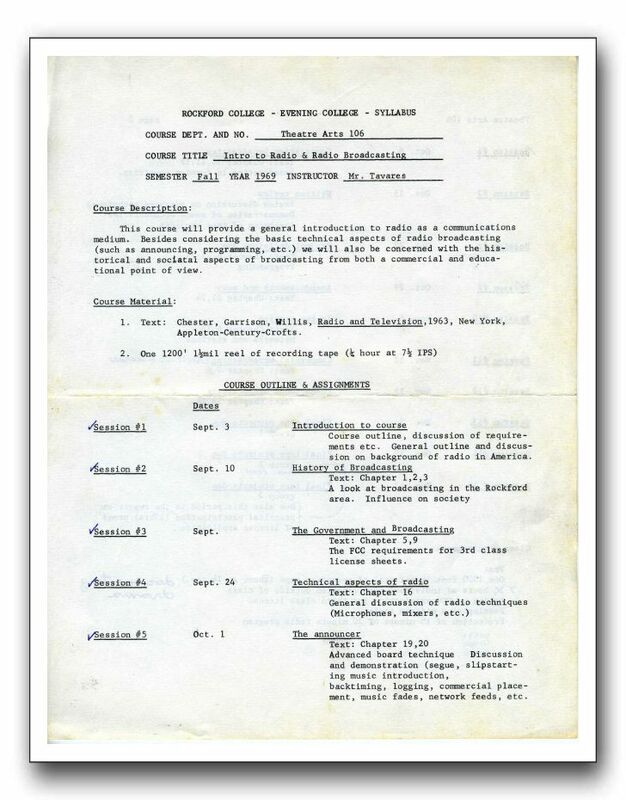 In the Fall of 1969, WRCR staff persuaded Rockford College to offer a broadcasting class. Through the efforts of John Spence, Frank Tavares a 6th grade teacher and part time announcer at WROK AM was hired to teach Intro to Radio & Radio Broadcasting in the night school. This is page 1 of the class syllabus. Frank Tavares is now the voice of NPR's underwriting announcements and he credits his time teaching at RC with convincing him to persue a career in education. Today he teaches broadcast management, media production, advertising, and marketing at Southern Connecticut State. He does the NPR announcements as a part time job.